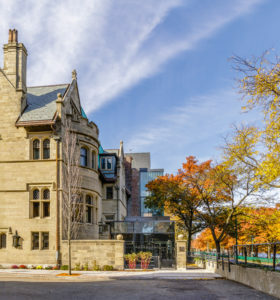 The Castle was originally built in 1915 and has been renovated and restored as the alumni center. It is on track to achieve LEED Gold. All exterior photos by Raj Das Photography. 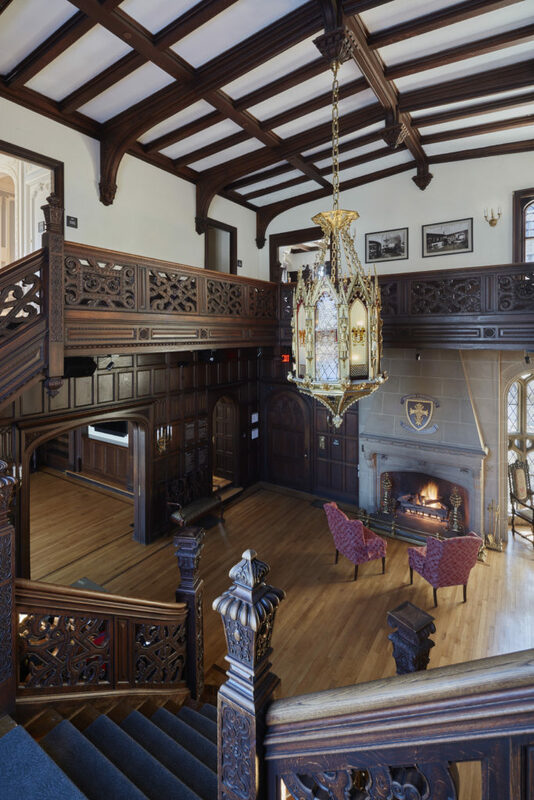 The Dahod Family Alumni Center at Boston University’s historic Tudor Revival-style “Castle” has been completely renovated, restored and revitalized. 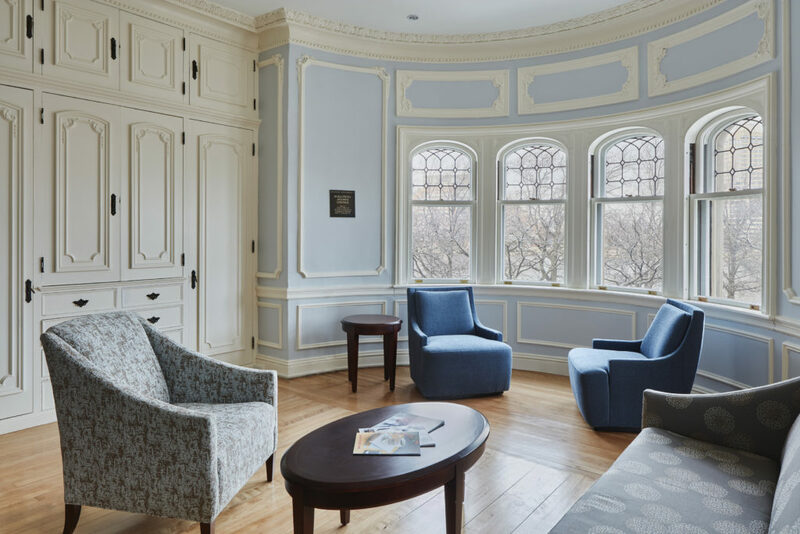 Located at the corner of Bay State Road and Granby Street, part of Boston’s Bay State Road Historic District, the 15,371-square-foot Dahod Family Alumni Center will serve as a vibrant new gathering place and “home away from home” for alumni on BU’s campus. The Castle renovation was funded through generous alumni donations. Finegold Alexander Architects served as the Architect of Record for the project. “The building is a testament to the power and generosity of the 335,000 Boston University alumni in 185 countries around the world. Our goal was to make this building a welcoming, vibrant gathering and meeting space for that network. The BU Castle has long been a beloved part of our campus and alumni are now able to enjoy the space on a daily basis,” said Steven Hall, vice president for alumni relations. 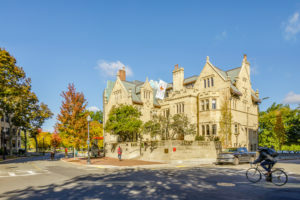 The building re-opened in September 2018 and was celebrated on Alumni Weekend September 20 to 23, and since that time it has been an active place. The Castle was originally built in 1915 by William Lindsey Jr. as a home for his family. Lindsey was a prominent Boston businessman, playwright and poet, who visited Britain for inspirational design ideas. The design, executed in the Tudor Gothic style by well-known Boston Architectural Firm Chapman & Frazer, was based on Athelhampton Hall in Dorsetshire, England. Many of the eclectic stone carvings were executed by Hugh Cairns, the sculptor of the figures in the frieze of the Trinity Church porch. In 1939, Oakes and Blanche Ames, the then owners, sold the mansion to William Chenery, who donated the house to the University. The Castle served as a home to university presidents and their families until 1967 when it was converted to a university-function facility for lectures, small concerts, weddings and all manner of university gatherings. The Castle’s interior features space for alumni to work, study and connect. Interior photos by Jane Messenger. Interior photos by Jane Messenger. The ground floor, long since altered, will house the revitalized and expanded BU Fuller’s Pub, an exclusive gathering place for the BU community. The insertion of a new 1,000-sq.ft. commercial kitchen enabled a greatly expanded menu for the Pub, while also serving faculty dining upstairs and catering for various events. “The upgraded kitchen features an expanded menu serving made-to-order burgers, fries, and other classic pub fare,” says Peter Smokowski, vice president for auxiliary services, Boston University. 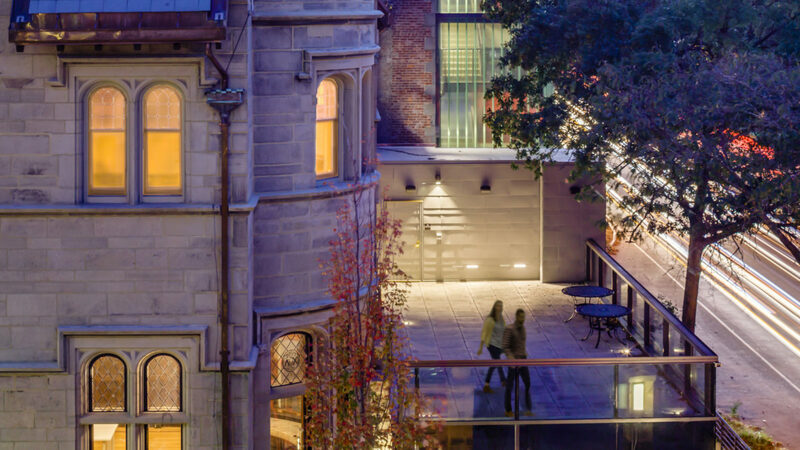 Creating the kitchen required a sensitive addition at the rear of the building – whose roof has also been captured as a terrace for events for all the building’s users. Other upgrades include new utility services, comprehensive M/E/P systems, and an insulated, vented roof structure below the slate. 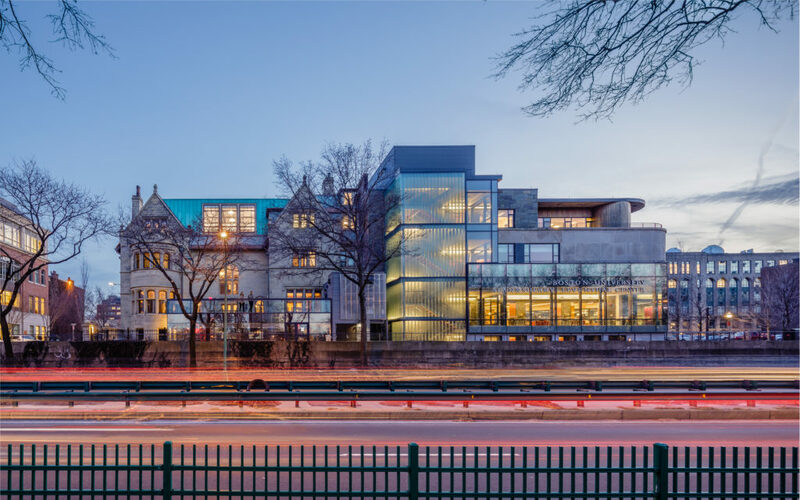 “The M/E/P and envelope improvements will allow the building to operate for another 50-100 years and are a testament to BU’s commitment to sustainability. The project is on track to achieve LEED Gold certification – no small feat for a historic restoration of a century-old house!” said Berry.